Last week at New Life Robinwood several children dedicated their lives to being fishers of men. Throughout the summer they heard stories about missionaries from around the world. Last Sunday, they committed their lives to being missionaries right where they live. 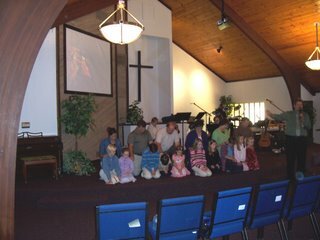 Our missionary to Brazil, Bruce Tissell was in church to commission and pray for them in their new role as real live missionaries. Throughout the fall, the kids of New Life Church will be participating in the "Be the Net" Campaign. They will be given several witnessing tools to put in their tackle boxes. Would you pray for the kids of New Life as they seek to spread the news of the excellence of Christ?